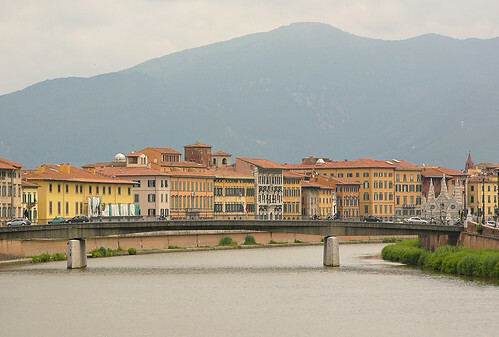 Pisa is a city of about 87,000 inhabitants in Tuscany and the capital of the province. According to a legend Pisa was founded by Trojan refugees from the Greek city of Pisa, which was located in the valley of the river Alpheus. Among the main attractions of the city are the famous Piazza del Duomo, which was declared World Heritage Site by the UNESCO. 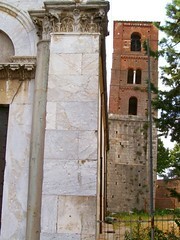 The marble Cathedral in the Pisan Romanesque style, which was built from 1063 to 1118 is located there. The bronze portal of St. Rainier, the patron saint of the city, was designed by Bonanno Pisano and the pulpit by Giovanni Pisano. The most famous monument of the place is the 56-meter-high Leaning Tower from the twelfth century. Its characteristic inclination began a decade after the start of construction. Today it is one of the most famous monuments in the world. The largest international airport of the region, “Galileo Galilei” and the three most important universities in Italy, the University of Pisa, the Scuola Normale Superiore and the Scuola Superiore Sant’Anna are located in Pisa. Pisa also has a number of major research institutes. In the province of Pisa you can find enchanting natural landscapes, rolling hills, vineyards and a number of lovely cottages, perfect for a holiday amidst silence, culture, excellent wines and good food.